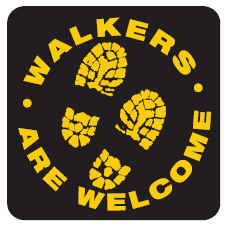 The walking challenges are split into 4 categories, Rainbow, Bronze, Silver and Gold and range in difficulty from easy, family orientated walks through to 19 mile hikes, with the Rainbow Award been designed specifically for young families up to the Gold Award, targeted at experienced hill walkers. To complete the challenges and gain a completion certificate you must first register and then complete a number of walks within that challenge..
To register click on the link above. When you have finished your challenge you can collect your certificate by e-mailing us at theuttn@gmail.com and telling us which walks you have completed. You can visit Middleton by bus. Arriva buses 75 and 76 and Scarlet Band buses 84 and 85 travel from Darlington to Barnard Castle and Scarlet Band buses 95 and 96 make the onward journey to Middleton-in-Teesdale. In addition Hodgsons operate a service from Middleton to Langdon Beck on a Wednesday. Timetables for these routes can be found by clicking the name of the bus company above. If you are arriving by car please be aware that Middleton is a busy village. If you are staying overnight in the village please park near your accommodation. If you are just visiting for the day please use one of our two free long term car parks. The bigger of these is on Bridge Street with 30 spaces and offers overnight parking. The other car park is at the Sports Club on Rose Terrace which offers around 10 free all day parking spaces. Please click on this link for a Google Map. ​For parking elsewhere in the dale for public toilets click here to go to the 'Car Parking' page.